​Pilot Point is a property dedicated to the conservation of native flora and fauna and is a research area for the Humboldt State University. The property is primarily forested with Sitka spruce, Douglas fir, red alder, and Ceonothus. Its southern slopes are home to the mountain beaver (Aplodontia rufa humboldtiana), a rodent unrelated to the true beaver. As a vegetarian that dines on fleshy herbs and shoots of young trees, the mountain beaver's status in the Trinidad area is seriously threatened by invasive plants such as English ivy and Andean Pampas/Jubatagrass. ​Pilot Point consists of a unique geological formation with exposed fossils, a variety of flora, and a spot to look out at sea. 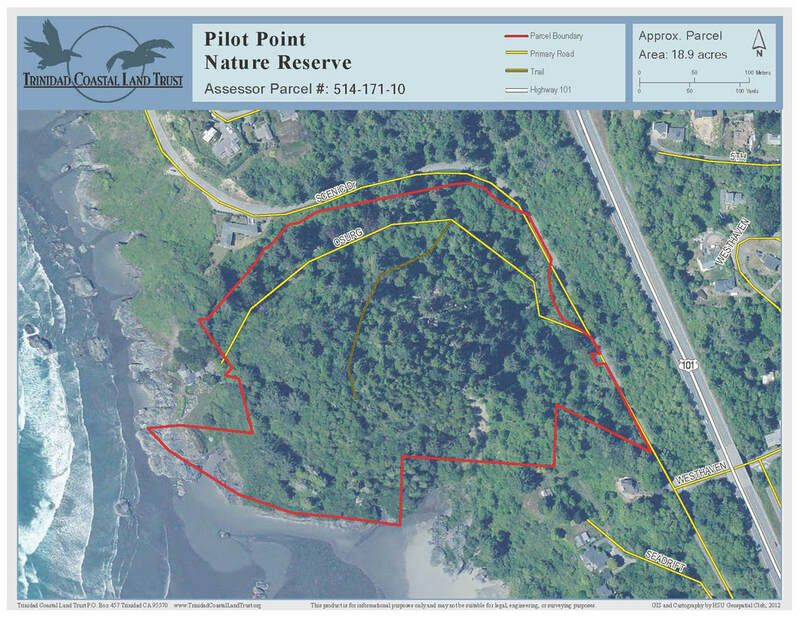 Pilot Point is a forested area located on a 200 foot tall coastal bluff . Pilot Point was acquired by Trinidad Coastal Land Trust “to preserve and conserve” its natural resources and unique qualities, including fossil beds representing a geologic era for which fossil findings are rare. ​There is no public access and no parking. Please inquire with the land trust for a field tour.